This is a review of the product Vitamins by Holland & Barrett. The manufacturer of this product claims that this product can contribute to the maintenance of normal and healthy hair by providing the hair with the required nutrients. Read on, to learn more about the ingredients of this product as well as our opinion of whether it is the right product to take for the growth of your hair. It is recommended that adults take just one tablet of this product daily, preferably with a meal. The ingredients of this product includes Manganese and if it is taken in an amount greater than that of 4mg then it can cause fatigue as well as muscle pain. It also contains iron, which can be dangerous for children if taken in a large dosage. In case of an accidental overdose or an allergic reaction to any of the ingredients of the product, you need to contact a doctor immediately. The price of this product is listed as $10 on the company’s website and includes 60 tablets which are enough to last for two months. The manufacturer also offers free shipping on every order of $15. The manufacturer has not offered any kind of guarantee for this product and this is an area of concern because if you are not satisfied with the results of this product then you have no way of getting your money back. The product only has a few reviews on the company’s website which are mostly positive. 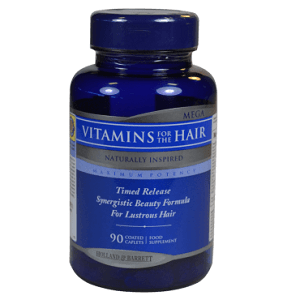 Vitamins by Holland & Barrett, is a product that has been designed to address the nutritional deficiencies of our body causing hair loss as well as the thinning of your hair. It is free from artificial flavors, colors and sweeteners as well as milk, wheat and gluten. However it does contain soy which can be unsuitable for different individuals. The manufacturer of this product also doesn’t offer any kind of money back guarantee and so this product might not be the best available option for you. John Brownstone	reviewed Holland & Barrett Vitamins	on July 29th	 and gave it a rating of 2.5.